What Does a Periodontist in Worcester Do? Dentist, orthodontist, periodontist, endodontist, prosthodontist—there certainly are a lot of “tists” in the dental field. So what exactly distinguishes a periodontist from all the others? Well, according to the American Academy of Periodontology, a periodontist is “a dentist who specializes in the prevention, diagnosis, and treatment of periodontal disease, and in the placement of dental implants.” Read on to learn more about this specialist and how one can help care for your smile. After completing four years of undergraduate work and four years of dental school, a dentist that wants to specialize inthe treatment of gum tissue continues for three more years of specialized education and training. They learn how to diagnose and treat periodontal disease, as well as perform cosmetic periodontal procedures. What Cases Does a Periodontist Treat? 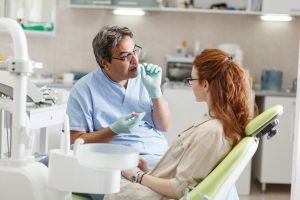 Dentists often send patients to a trusted periodontist when they have more problematic periodontal concerns, such as severe gum disease that is made more difficult by a complex medical history. Because periodontists have so much knowledge about gum tissue and the underlying bone structure, they are extremely qualified to perform dental implant surgery. Using cone beam technology that provides 3D images of your teeth, roots and bone structure, your implant surgery is planned in detail. A periodontist will work closely with your restorative dentist to ensure that the resulting tooth is sturdy and attractive. During your first appointment, the periodontist will review your dental and medical histories. Be sure to bring a list of the medications you currently take and any health issues you have as some can affect your periodontal health. The periodontist will examine your gums and check for signs of gum recession. Digital X-rays may also be taken to evaluate your jawbone. If your dentist has told you that you have gum disease, or if you need a dental implant, then a periodontist is the dental professional to see. Call today to schedule an appointment. Dr. Handsman and Dr. Jenny are periodontists in Worcester. Both are trained and skilled in the diagnosis and treatment of periodontal disease. They offer both non-surgical and surgical treatments as well as dental implant surgery. Call to schedule an appointment today. Comments Off on What Does a Periodontist in Worcester Do?